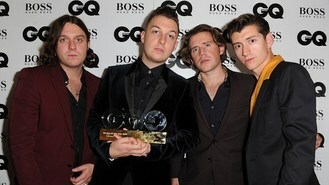 The band, fronted by Alex Turner, are the first act on an independent record label to see five albums debut at number one. The album, released by Domino Records, went straight to the top of the charts in the week it was revealed to be in the running for this year's Barclaycard Mercury Prize. It is the third nomination for the Sheffield band, who took the prize in 2006. In the past seven days, more than 157,000 copies of AM were sold in the UK, making it the second-fastest selling album of the year behind Daft Punk's Random Access Memories, which sold 165,000 copies in its first week of sale in May. Martin Talbot, chief executive of the Official Charts Company, said: "Congratulations to the unstoppable Arctic Monkeys and all at Domino Records. Scoring a fifth official number one studio album in a row is an exceptional achievement." Up-and-coming indie pop group London Grammar took the number two slot with debut album If You Wait, the Official Charts Company said. Last week's number one, 1975's self-titled debut, came in at number three while there were new entries at number four, for Goldfrapp's Tales of Us, and five, for Snapshots by Strypes. Rod Stewart's Time shot up 20 places to number six, while he also had a new entry at 35 with Rarities. There were other new entries for Weeknd at 12, with Kiss Land, while The Clash's greatest hits album The Clash Hits Back is at this week's number 13. Janelle Monae's The Electric Lady was another new entry at 14. Pop princess Katy Perry held on to the top in the singles chart with Roar, while OneRepublic's Counting Stars climbed from 13 to two. Ellie Goulding slipped one place to number three with Burn, followed by Avicii's former number one Wake Me Up. Hold On We're Going Home by Drake, featuring Majid Jordan, rounded off the top five. There was a new entry for Coldplay at 12 with new single Atlas, from the soundtrack for Hunger Games: Catching Fire. Example came in at 13 with All the Wrong Places. There were other new entries in the top 40 for Ben Pearce, with What I Might Do at number 25, and Lethal Bizzle at number 29, with Party Right.